The Overpack Label (Labelling & Marking of Overpacks). Buy Online. Overpacks are enclosures used by shippers to contain one or more packages of dangerous goods to form a single handling unit. This makes handling and stowage more convenient during transport. Overpacks usually take the shape of several crates or boxes that have been secured to a pallet and shrink-wrapped/strapped, but they can also be single receptacles, such as a gas canister, placed into another protective outer box or other packaging. Overpacks must be marked with the word ‘Overpack’ or an Overpack label. Overpacks make the loading of cargo units simpler and quicker and they can add extra protection to ensure that dangerous goods are kept safe during transport. The overpack, and each package inside, must be marked and labelled in accordance with the relevant transport regulations: IATA (Air), ADR/RID (Road/Rail) and IMO/IMDG (Sea). When labelling overpacks for air transport, the overpacks must repeat the labelling and marking on the individual packages and be additionally marked with the word OVERPACK (or an Overpack label) as well as other information such as the proper shipping name of the contents (in English), the UN/ID number and the names and addresses of the shipper and consignee. When you ship overpacks by air the net weight of dangerous goods should be displayed if there is more than one package in the consignment. and in addition to the marks on the exterior of the overpack, you must apply the appropriate hazard labels for the contents, as well as the appropriate handling and shipping labels, ie this way up arrows, magnetized material, cargo aircraft only etc. IATA also identifies several different circumstances where particular labelling is required such as ‘Magnetised Material, and the Cargo Aircraft Only (CAO) label, to be used when quantities or types of goods that are not permitted on passenger aircraft are consigned and this signifies that the packages shall only travel on cargo aircraft. Generally, for road and rail, overpacks must show the hazard labels (warning diamonds – primary and subsidiary, if they are required) for each dangerous goods package contained in the overpack and any additional handling markings appearing on the packages. 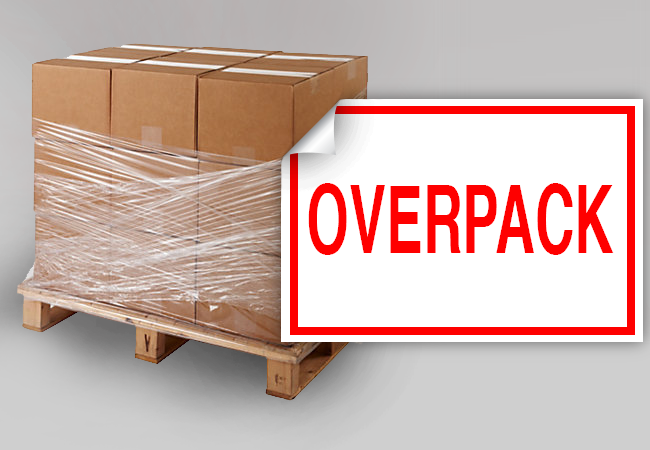 Overpacks must also be marked with the word ‘OVERPACK’ in the official language of the country of origin. If that language is not English, French or German, then it must be marked in one of those languages also. The overpack text must be at least 12mm high and is usually in red or black. The UN number of each substance inside the overpack must be shown, and this must be preceded by the capital letters ‘UN’. If the inner packages contain the Environmentally Hazardous Substance (EHS) mark, then this must also be shown on the overpack. The overpack must also display orientation arrows, on two opposite sides, if the inner packages display them but they are not visible through the outer packaging. If the packages contain liquids then orientation arrows are always advised on the overpack. The proper Shipping Name (PSN) and UN Number (preceded by the letters ‘UN’) and warning diamond class for each substance contained within the overpack. Marked with the word ‘OVERPACK’ or an overpack label. Orientation arrows on two opposite sides. The Marine Pollutant marks, when in accordance where necessary.